The two-year, 67-credit, cohort-model BASW program in Seattle begins September 2019. By September (not necessarily by the time of application), students must have earned a minimum of 65 college credits and completed two prerequisites (one qualifying course each in Psychology and Sociology, with a 2.0 “C” grade or higher) with a minimum 2.0 cumulative GPA to be eligible. See the BASW application page and attached PDF for details. Students should begin soon, as the application takes time: an essay is required, as well as one special recommendation form. We holistically evaluate applications and value relevant social service and human service experience. The Social Welfare program is a fantastic fit for undergraduates who are passionate about social justice, helping others, and enacting change. It combines classroom learning, community service, and 480 hours of supervised field education to give students relevant real world experience necessary for becoming focused and effective change makers. The BASW serves as an excellent foundation for aspiring leaders, helpers, innovators, community organizers, and social service professionals. This professional degree program supports students in acquiring a critical lens on human behavior and social systems, and is accredited by the Council on Social Work Education (CSWE). 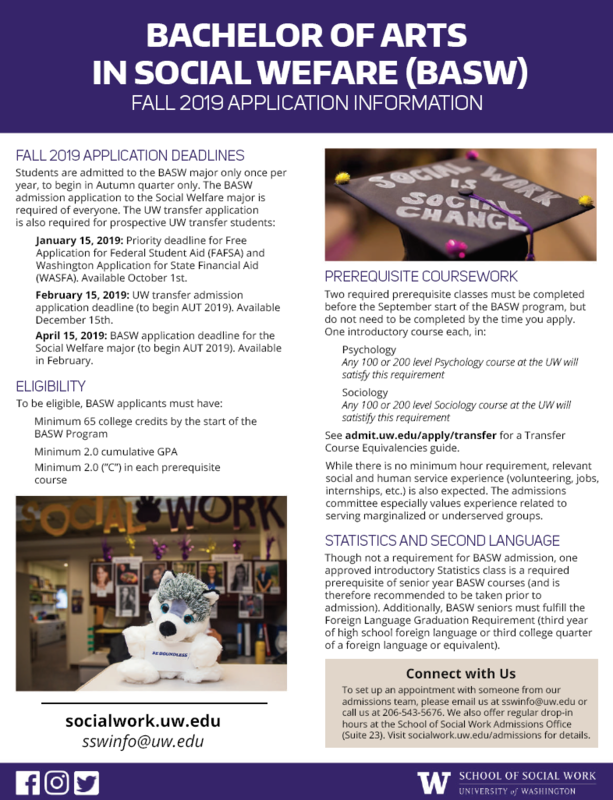 BASW graduates are eligible to apply to our accelerated 10-month Advanced Standing Master of Social Work program, exclusively for BASW graduates. Our versatile alumni serve in a wide range of roles. While many BASW graduates go on to earn Master of Social Work (MSW) or PhD in Social Welfare degrees, others pursue graduate degrees in related fields such as Public Health, Psychology, Public Policy, Education, Law, and more. Social work is social change!